We are delighted to welcome you to our internet site! We would like to introduce you to our products and our factory on the following sites - in the same way, we built our machines: Passionately, innovative, customized and always with a smile on our lips. Don't hurry, inform yourself and use our machine configurator - it will show you right away which is the most suitable machine for you. We thank you for your interest and wish you a nice day! Highest quality is natural to us – from the first drawing to the last screw. We manufacture 95% in our factory. Through and through „Made in Germany“. 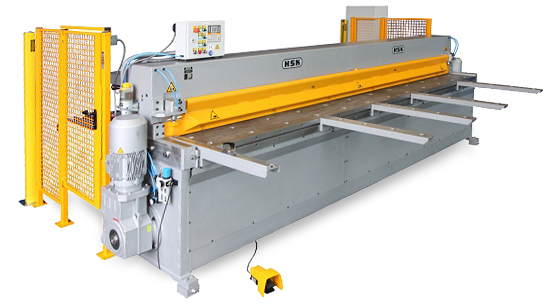 Do you have an old HSK-Shear manufactured in 1980, 1970 or earlier? You don´t want to depart from the machine but it should be overhauled? Karl Huttenlocher founded his mechanical workshop in 1915. Out of this workshop a specialized factory developed to manufacture guillotine and coil shears. Our modern machinery is available for your production orders of all kind. What can we weld, mill, lath or cut for you? © 2018 HUTTENLOCHER & SCHÄFER GMBH. All rights reserved.